Bad news, detective! 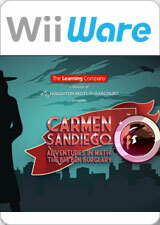 Those vicious villains of V.I.L.E are at it again in Carmen Sandiego Adventures in Math: The Big Ben Burglary. This time they've struck Big Ben in London, England! Just when we think we've put a stop to their trouble, they come up with a new scheme to vex us. The Chief wants ACME’s best agent on this case, and that means you, detective. So grab your gear—you're headed to London! The graph below charts the compatibility with Carmen Sandiego Adventures in Math: The Big Ben Burglary since Dolphin's 2.0 release, listing revisions only where a compatibility change occurred. This page was last edited on 31 January 2018, at 00:58.